Top photo, from left: Ashley Norris, CRNA; Leah Pearl, SRNA; Tenylle Allen, SRNA; and John Stitt, CRNA on Capitol Hill advocating for for Vermont nurse anesthesia practice at Vermont Senator Patrick Leahy’s office. 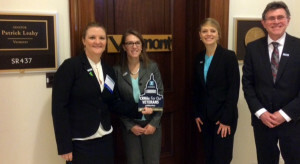 Bottom photo, from left: UNE students Lean Pearl and Tenylle Allen on Capitol Hill for the AANA Mid-Year Assembly. Both students were sponsored by VTANA. 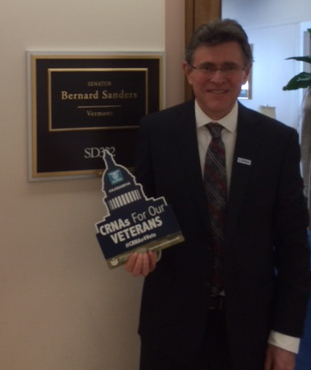 Photo on right: UVM Medical Center CRNA John Stitt visits Vermont Senator Bernie Sanders’ office to advocate for CRNA care of veterans. Veterans’ access to timely, quality healthcare was the focus of a rally held today on the west lawn of the U.S. Capitol by approximately 500 nurse anesthetists from around the country. Certified Registered Nurse Anesthetists (CRNAs) have been outspoken in their support of a plan proposed by the Veterans Health Administration (VHA) to expand veterans’ access to healthcare by allowing advanced practice registered nurses (APRNs), including CRNAs, to practice to the full extent of their education and licensure. The policy, recommended by a major Independent Assessment of the VHA as well as by the Institute of Medicine and already in place in America’s military and Indian health systems, would help eliminate the dangerous wait times for needed care that America’s veterans currently endure. By updating its regulations to include APRN/CRNA full practice authority, the VHA will make use of an already existing workforce that ensures veterans have access to essential surgical, obstetric, emergency, and pain management healthcare services without needless restrictions or having to travel long distances for care. 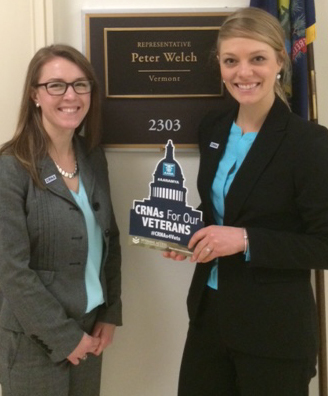 This was the second year in a row that CRNAs and student registered nurse anesthetists have rallied on Capitol Hill in support of patient care improvements. The rally was organized by the AANA, which represents more than 49,000 nurse anesthetists nationwide. More than 6,000 APRNs, including 900 CRNAs, work in VHA facilities across the country. In addition, the AANA’s National Health Leadership Award was presented during the rally, honoring Senators Jeff Merkley (D-OR) and Mike Rounds (R-SD). Merkley and Rounds are co-sponsors of Senate legislation (S. 2279) which expands veterans’ access to care by supporting APRN full practice authority in VHA facilities. Both senators spoke at the rally. Also speaking were AANA President Quintana; President-elect Cheryl Nimmo, DNP, MSHSA, CRNA; and AANA Senior Director of Federal Government Affairs, Frank Purcell, BS. Caring for America’s active-duty and reserve military personnel, as well as military veterans, has long been a hallmark of the nursing community at large, and nurse anesthetists in particular. Nurses first gave anesthesia to wounded soldiers on the battlefields of the American Civil War, predating physician anesthesiologists by decades.